In order to feel well, we need to take care of our bodies. 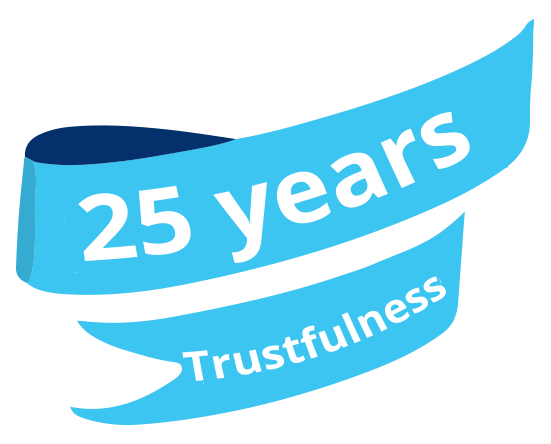 More than 25 years ago, we created Lactoflor: the first Bulgarian probiotic product based on the lactic acid bacteria, Lactobacillus bulgaricus. Discovered by scientists in 1905, the bacterium bulgaricus (prevalent in Bulgaria) is considered a natural source of health and longevity, actuated by Bulgarian nature. The mission of Lactoflor is to restore the balance of the gastrointestinal tract, enhance immunity, regulate metabolism, and, most of all, awaken our inner strength. Good health starts within. Enjoy life, rich in a diverse diet and activity. We all have the right to live our lives the way we want. Lactoflor. healthy life. In Two Words: Good Bacteria. The root of the word probiotic originates from the Greek words pro (for) and bios (life), or ‘for life’. According to the Food and Agriculture Organization of the United Nations (FAO, 2001), probiotics are ‘live microorganisms which, when administered in adequate amounts, confer health benefits on the [human] host’. Probiotics are live microscopic organisms which help balance gastrointestinal microbiota. Simply put, they are the supplement necessary to ensure victory of good bacteria over bad bacteria. When good bacteria rule over bad bacteria, we are able to clense ourselves from toxins, boost our immune system, and even have fresh, beautiful, radient skin. Up to 70% of the world’s population today needs improvement of the microbiota in their intestinal tracts. 2. Conditional pathogens—which under normal conditions are not able to cause a disease but become pathogenic when immune protection is impaired. 3. Beneficial—which have beneficial effects on the body. The ratio of these groups of microorganisms conditions the normal functioning of the gastrointestinal tract and immune system and, consequently, human health. In addition to being abundant, intestinal flora is extremely susceptive to external stimuli. Worsening environmental conditions and changes in the resilience of our bodies virtually kill good bacteria in the body, due stress, inappropriate diet, intake of antibiotics and immunosuppressants, sleep deficiency, and bacterial infections. Let’s face it probiotics cannot fully replace intestinal flora. But they can facilitate the development of good bacteria, which maintain the balance of intestinal flora. And they can help people to feel healther, more beautiful, and happier. 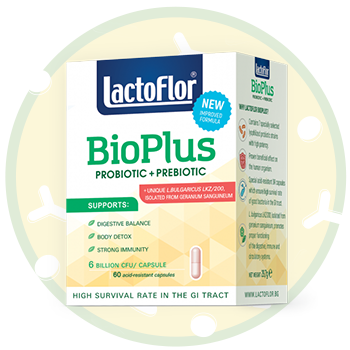 Lactoflor offers the first range of probiotics which contain natural, beneficial bacteria isolated from Bulgarian nature in combination with prebiotics, intended for easier absorption into the total intestinal flora. Bulgarian yoghurt is the oldest probiotic known to humankind. Since ancient times, yoghurt has been used as food to strengthen health and contribute to longevity. Its nutritional value and health properties have been shrouded in myth and legend. 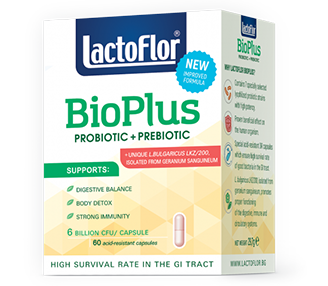 This ancient, renowned probiotic forms the basis of the entire product range of probiotics with the trademark Lactoflor. Lactoflor’s secret lies in the symbiosis between Lactobacullus bulgaricus and Streptococcus thermophilus, which is the only synergy that, during fermentation, results in obtaining the valued properties of Bulgarian yoghurt. Probiotics are good bacteria which help restore the balance of gastrointestinal microbiota and consequently improve our immune system and health. Prebiotics are the food of good bacteria and include fibers which help develop the beneficial effect of probiotics and their survival in the human intestinal tract. In Lactoflor, we use inulin—a bio prebiotic extracted from chicory roots. It is proven that inulin can increase good bacteria over tenfold. In Lactoflor, we believe that happiness is hidden where it is least expected—in the millions of good bacteria living in the gastrointestinal tract, which contribute to a stronger immune protection, more beautiful skin, and even body weight regulation. Probiotics restore the balance of gastrointestinal microbiota and help boost our immune system and health. This is especially true after the intake of antibiotics, which literally destroy the population of good bacteria in the body. helps strengthen our immune system. In other words- Probiotics contribute to improving our health. When balanced, our microbiota works considerably better. 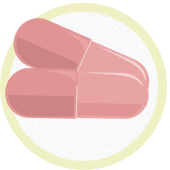 Taking probiotics aids in protecting against digestion disorders and intestinal discomfort. The intake of probiotics results in quicker elimination of harmful substances from the body and, therefore, helps reduce toxins that the body is struggling to remove, in case they stay longer in the digestive system. Lactoflor BioPlus Tablets are synbiotic chewable tablets which contain unique Bulgarian strains (L. bulgaricus LKZ-200, L. rhamnosus LLR-L1 (with high bioavailability and enhanced activity against Candida, E.Coli, and St.Aureus) and Streptococcus thermophilus), as well as isomalt and prebiotics (inulin- fibre). 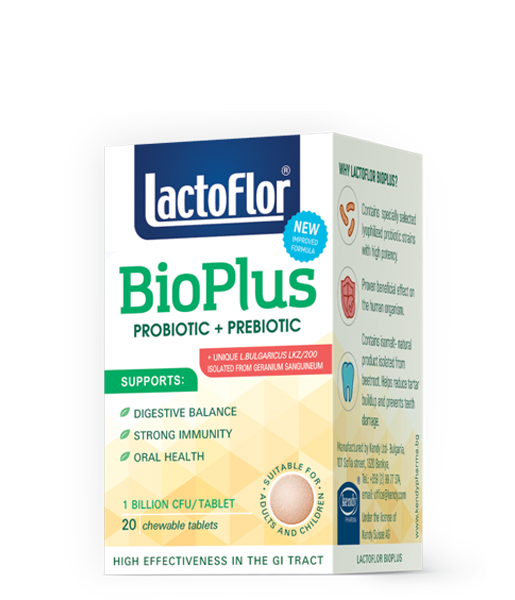 ?Lactoflor BioPlus Tablets reduce gum inflammation, prevent formation of dental plaque in the oral cavity, counteract bad bacteria, and facilitate intestinal comfort. Lactoflor BioPlus Capsules is a synbiotic product which contains 7 strains of lactic acid bacteria (with high bioavailability) and prebiotic (inulin). In addition to Lactobacillus acidophilus, Streptococcus thermophilus, and Bifidobacterium sp. (B.bifidum; B.longum; B.infantis). Lactoflor BioPlus Capsules are also enriched with two unique Bulgarian strains: Lactobacillus bulgaricus (isolated from Geranium sanguineum) and Lactobacillus rhamnosus. Lactoflor BioPlus Capsules restore intestinal microbiota balance and are suitable for prevention, detoxication, and long-term intake. 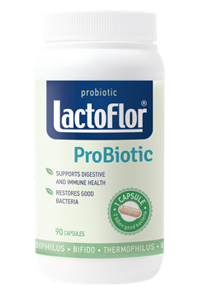 Lactoflor ProBiotic supports the functioning of gastrointestinal microbiota affected by intestinal infections or antibiotic treatment and improves our immune system. 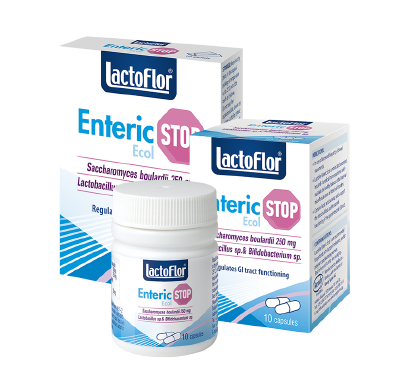 Lactoflor Enteric Ecol is a probiotic product containing Saccharomyces boulardii and lactic acid bacteria that stops diarrhoea in a natural way and restores functioning of intestinal microbiota, respectively. 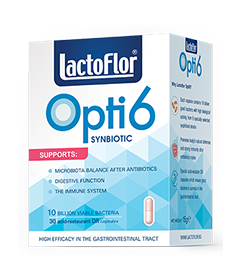 Lactoflor Opti6 is a powerful probiotic immune boost formula, suitable during and after antibiotic treatment. Opti6 contains 6 strains of lactic acid bacteria (with high biological activity) and prebiotic (inulin), ensuring anti-microbial activity against various pathogens. These strains improve digestion and intestinal microbiota balance. 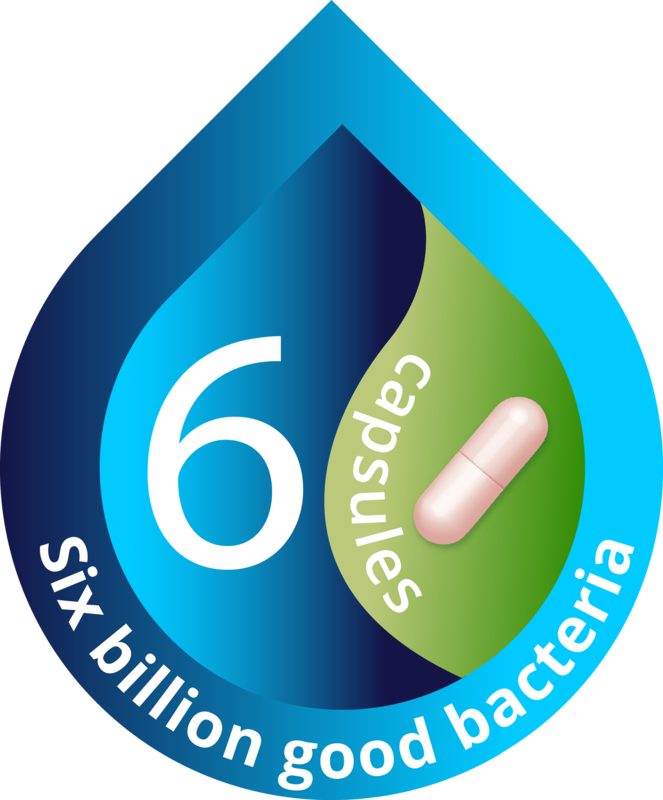 The beneficial bacteria contained in Opti6 Opti6 are derived from environmentally clean, well-preserved, organic sources of Bulgarian nature. 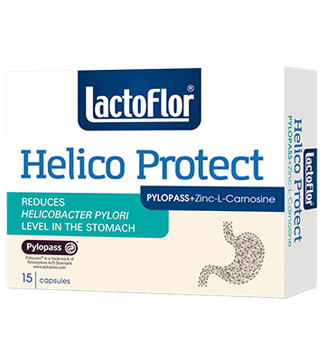 Lactoflor Helico Protect is a probiotic product containing a combination of Pylopass™ (a proprietary strain of clinically tested Lactobacillus reuteris ) and Zn-L-carnosine. The combined substances specifically co-aggregate with H.pylori (bad bacteria) and ensure their effective removal from the gastrointestinal tract. A new-generation synbiotic containing 7 types of lactic acid bacteria with a high biological value and prebiotic , which improves digestive processes. Beneficial bacteria contained in Lactoflor Opti6 are isolated from environmentally clean, well-preserved organic sources of Bulgarian nature. Isn’t it sufficient to only eat yoghurt? It has been said that yoghurt is a natural probiotic that helps our bodies, with no need for supplements. But this is not enough. Find out why. It has been said that yoghurt is a natural probiotic that helps our bodies, with no need for supplements. But this is not enough. The trend to use probiotics on a large scale is comparatively new (since the end of the 20th century). If our diet is nutritious and wholesome, supplements, such as probiotics, are not needed. Probiotics are live microorganisms which can be utilised in various products, including food, medication, and supplements. The first probiotic products manufactured were actually natural probiotics, such as fermented food (cereal, roots, tubers, fruits and vegetables, milk, meat, and fish). 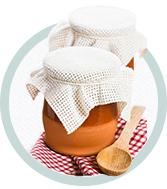 But not all types of fermented food with the help of lactic acid bacteria are probiotic. Only those that have been proven via oral administration of specific probiotic strains-in at least one well-planned clinical study-have beneficial effects on health. Apart from the intake of natural and organic foods, probiotics are natural products which should be part of our daily diet. Optimum care of our health includes combining appropriate nutrition, active lifestyle, and intake of probiotics. Probiotics facilitate and strengthen the development of our immune system protection. Can probiotics be used by pregnant women? Is it harmful to take probiotics while breastfeeding? Probiotic supplements from natural food sources, such as those in Lactoflor products, are considered safe to use by pregnant women. There are no negative reports about the effects of LactoFlor products on pregnant women. Nonetheless, it is best to consult your physician before taking any supplement. Do probiotics cause weight gain? If I take probiotics, my weight will spike because.... This is definitely a wrong statement. Find out why. This is definitely a wrong statement. Probiotics are live microorganisms which feed on nutrients available in the human digestive tract. You will not gain weight through the intake of probiotics. Do probiotics detoxicate the body? Rest assured. Probiotics will have an effect. What kind of effect? Find out here. Probiotics do have an effect on our bodies. One of the ways probiotics operate is digesting food and competing for nutrients with pathogenic microorganisms, which are partly to blame for the formation of toxins in the body. In addition, probiotics modify toxins caused by pathogenic bacteria. If we look and feel better when we are healthy, the intake of probiotics will further influence the way we look and feel. Should probiotics be taken before, after, or with food? Probiotics can be taken any time. Check out when is the best time to take probiotics. Probiotics can be taken any time. But the best results are realised when probiotics are taken in the evening, just before bed, because bacteria contained in probiotic products have a longer period to adapt and colonise in the gastrointestinal tract. Is there a risk of overdosing with probiotics? Can you overdose with yoghurt? 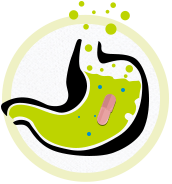 It is recommended to comply with the dosage described in the probiotic supplement leaflet. The risk of overdosing is minimal. Yet, the product should be used with caution. Dosis sola facit venenum (The dose creates the poison). What is the optimum concentration of live bacteria in probiotics? Should I rely on quality or quantity? The optimum dose of probiotics varies, depending on the strain and product. Although a number of commercial products have a concentration ranging from 10 million to 300 billion per day, some products have proven to be effective at lower levels, while others require significantly higher doses to be effective. It is not possible to specify a universal concentration of probiotics. 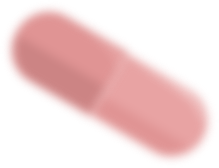 The dose should rather be based on observations and experience obtained during clinical studies that demonstrate beneficial effects on the health of the consumer of the probiotic product. Accordingly, concentrations and proportions of the various bacteria in Lactoflor products have been determined in the course of such clinical studies. Why are these particular bacteria chosen in Lactoflor? How have you selected the strains to strengthen the body’s immune protection? Или как точно сме подбрали щамовете, с които подсилваме имунната защита на организма? Our combination of probiotics is selected on the basis that some types of Lactobacillus and Bifidobacterium are natural inhabitants of the human digestive system and are, accordingly, not contagious or toxic. The traditional lactic acid bacteria—such as Lactobacillus acidophius, Lactobacillus bulgaricus, Streptococcus thermophilus—have a long history associated with the fermentation of food. As part of food and supplements intended to improve overall health of the population in conventional levels of use, probiotics are safe to take. The strains of bacteria included in Lactoflor probiotic cultures have been selected in vitro, according to their wholesome potential. How can we know if probiotics work? When are the bacteria live and viable? Probiotics are live microorganisms which, when administered in adequate amounts, confer health benefits on the human host. These are live bacteria. Microorganisms contained in Lactoflor products are lyophilised (freeze-dried). The process of lyophilisation guarantees, to the highest degree, that the viability of bacteria will be preserved for the longest period of time. How do we store Lactoflor? Why should I keep it in the fridge? It is recommended to keep Lactoflor in a refrigerator or in a cold, dry place, away from direct sunlight. See package instruction. If taken from the refrigerator, will Lactoflor still have an effect on our bodies? If Lactoflor stays out of the refrigerator for over 30 minutes, it will not have an effect on our bodies. Do good bacteria survive in the stomach by the time they reach the intestines? What is the secret to their survival? Do Lactoflor bacteria survive and why? Systematic research has identified those strains of lactic acid bacteria and Bifidobacterium which do survive in the human gastrointestinal tract. Their stability has been tested in simulated saliva, artificial gastric acid, pancreatic juice, and bile salts (Charterisetal., 1998; Dunneetal., 2001). 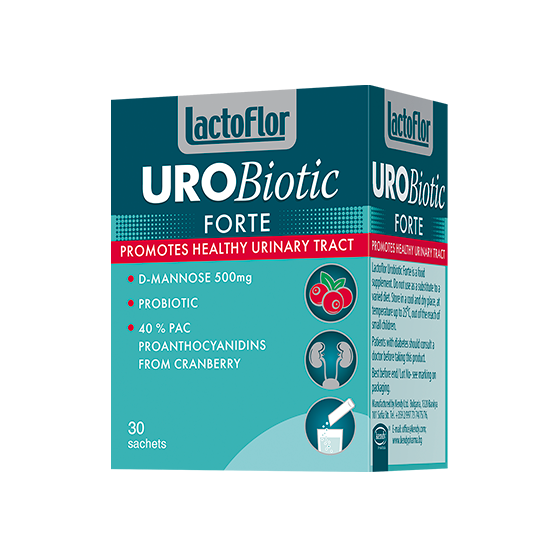 Furthermore, Lactoflor includes a selection of strains that have pronounced antagonistic action in respect of intestinal and extra-intestinal microorganisms. When is it best to take Lactoflor with antibiotics? Before, after, or with the intake of antibiotics? 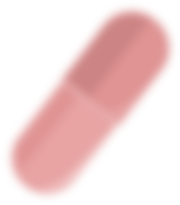 Probiotics should be taken after antibiotic treatment because antibiotics have an inhibiting effect on live probiotic bacteria. What is the optimum combination of strains in probiotics? Why is the Lactoflor combination optimally good? How exactly does it act? We have selected a versatile range of lactic acid microorganisms to achieve the maximum effect of the probiotic in the stomach, small intestine, and colon. Each individual lactic acid microorganism, however, has a specific activity of its own. It has been found, for example, that Lactobacillus bulgaricus has a well-pronounced antimicrobial action; Streptococcus thermophilus triggers the synthesis of interferon and consequently activates the body’s immune protection functions—it also decreases changes in DNA caused by the action of chemical mutagens in the intestines. How long should I take probiotics? What is the optimum duration? 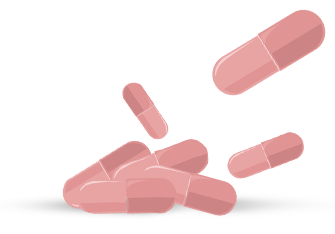 How many capsules/lozenges/sachets should I take per day and for how long? Probiotics are not harmful or toxic and nothing counter-indicates their continuous use. The daily allowance is determined on the basis of results observed in the clinical study of the product, i.e. concentration below which the product has no effect and concentration over which no increase of the beneficial effect is observed. There is a known cumulative effect with the intake of probiotics. (A certain period of time needs to pass before the probiotic can realise its action.) This period varies for different people, from 2-3 days to 2 weeks. To ensure a positive and long-lasting effect, Lactoflor should become part of your daily routine. Our lifestyles are associated with increased stress and frequent travel, usually with the lack of a healthy diet and routine. This is why—along with changing perceptions of the world and life itself—we should make probiotics part of our daily diets, taking 4-8 tablets per day in order to enable good bacteria to populate our intestinal tract and regulate its balance. Because it helps balance the normal gastrointestinal microbiota, which facilitates a better absorption of food, strengthens immune system protection. 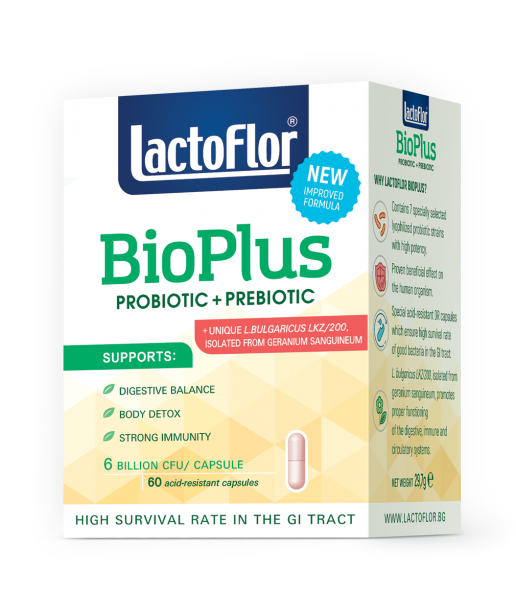 Lactoflor is based on a low-lactose, lyophilised, fermented lactic product, with high biological value and combined prebiotic and probiotic effect. Lactoflor contains essential biologically-active substances with a lactic or microbial origin or added substances, such as pectin (in the tablets), inulin, oligopeptides and dipeptides, free amino acids, unsaturated fatty acids, short-chain fatty acids, lactic acid, glucose, galactose, fructose, vitamins, bacteriocins, exopolysaccharides, minerals, and other ingredients. Due to Lactoflor’s low-lactose content, there is no need for supplements. • Contributes to balancing normal gastrointestinal microbiota and improves levels of beneficial intestinal microbial fermentation. • Effective in cases of constipation, lactose intolerance, and functional dyspepsia. • Helps restore healthy gastrointestinal microbiota after antibiotic treatment and in stressful conditions. • Helps maintain normal intestinal peristalsis and functioning. • Inhibits development of pathogenic microorganisms. • Regular intake protects against digestive disorders and intestinal complaints. • Supplies essential nutrients of bacterial origin: amino acids, vitamins, short-chain fatty acids, peptides. Lactoflor is a natural product. Find out about the strains of lactic acid bacteria in Lactoflor. The strains of lactic acid bacteria in Lactoflor are isolated from environmentally-clean organic Bulgarian sources (dairy products) and natural reserves that are not genetically modified. .
Why isLACTOBACILLICUS the most beneficial strain? Why is it in the core of Lactoflor? Why is LACTOBACILLICUS the most beneficial strain? A century ago, Ilya Mechnikov (Russian scientist, professor at Pasteur Institute in France, Nobel Prize winner) hypothesised that lactic acid bacteria (LAB) have health benefits, stimulating our longevity. He presumed that ‘intestinal autointoxication’ and subsequent aging can be suppressed by a modification of gastrointestinal microbiota and by replacing proteolytic microbes, such as Clostridium, with beneficial microbes. (Proteolytic microbes produce toxins, including phenols, indoles, and ammonia as a result of breaking down proteins.) Mechnikov developed a diet of yoghurt, with bacteria, which he called ‘the Bulgarian bacillus’ (Lactobacillus bulgaricus). All Lactoflor probiotic supplements contain this very bacteria. Why are Bulgarian probiotics good? Why can you rely on the quality of the Bulgarian probiotic Lactoflor? Bulgaria has a long tradition in the manufacturing and development of yoghurt, as well as in the selection of probiotic strains. In 1905, Stamen Nikolov, a Bulgarian physician, made a discovery in the microbiological laboratory of Professor Léon Massol, in Geneva. The existence of yoghurt is attributed to a specific strain of bacillus, which the scientific community (in recognition of the Bulgarian scientist Stamen Nikolov) called Lactobacillus bulgaricus. Nikolov’s follow-up research, conducted in various institutions all over the world, demonstrated that Bulgarian yoghurt helps in treating a wide range of diseases and conditions, including infections, otorhinolaryngeal disorders, tuberculosis, gastric and duodenal ulcers, gynaecological diseases, and fatigue. These prophylactic and healing properties of Bulgarian yoghurt are attributed to Lactobacillus bulgaricus, a wide variety of vitamins (including B1, B2, C, A, D, E, PP, B12), lactose, proteins, and other natural stimulants. Why LACTOFLOR KIDS the ideal product for children? Because it is a combination of seven bacteria and nine probiotic strains. LactoFlor Kids is a combination of four types of lactic acid bacteria, three strains of the useful Bifidobacterium and fibers with proven beneficial activity. 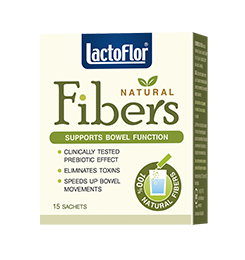 Lactoflor Kids helps strengthen children’s immune system and is effective in constipation, digestive disorders, and intestinal infection, as well as for recovery from the use of antibiotics. Digestive systems in babies and young children are not yet well developed, and the delicate balance in their gastrointestinal tracts can easily be disturbed, as a result of improper diet, viral infection, antibiotic treatment, etc. Lactoflor Kids is a probiotic product specifically developed for babies and young children. It contains a careful selection of seven strains of lactic acid bacteria. Each type of probiotic microorganisms contained in LactoFlor Kids contributes to regulating the gastrointestinal flora and improvement of children’s immunity. Most importantly, Lactoflor Kids includes a special children-specific bacterium: Bifidobacterium infantis. Bifidobacterium infantis (B.infantis) are beneficial bacteria that produce an acid which hinders the development and colonisation of pathogenic microorganisms and also plays a major role in the proper functioning of children’s metabolism and digestion. B.infantis restore intestinal balance and help in cases of bloating, gas, diarrhoea, constipation, and stomach discomfort. Lactoflor Kids is enriched with a prebiotic component called oligofructose, which is a natural source of fiber that supports the activity of good bacteria and facilitates digestive processes. 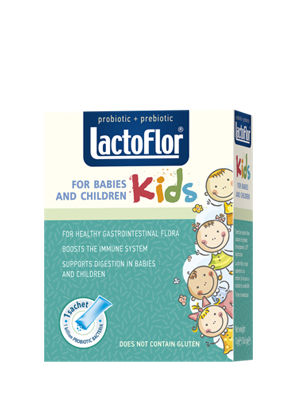 Lactoflor Kids improves digestion and absorption of food nutrients, as well as strengthen children’s immune system. Lactoflor Kids is exceptionally simple to use—simply dilute with water or milk. What are the advantages of taking Lactoflor? Lactoflor contains essential biologically active substances. Lactoflor is based on a low-lactose, lyophilised, fermented lactic product, with a high biological value and a combined prebiotic and probiotic effect. Lactoflor contains essential biologically-active substances with a lactic or microbial origin or added substances, such as pectin (tablets), inulin, oligopeptides and dipeptides, free amino acids, unsaturated fatty acids, short-chain fatty acids, lactic acid, glucose, galactose, fructose, vitamins, bacteriocins, exopolysaccharides, minerals, and other ingredients. Can Lactoflor be taken during antibiotic treatment? Yes, so that it can rectify a lot of damage caused by antibiotics. Lactoflor can rectify damage caused by antibiotics. Antibiotics destroy harmful bacteria in our body, but they also destroy colonies of good bacteria, as well as the balance of our gastrointestinal microbiota. The systematic use of antibiotics can lead to dysbiosis and the development of fungal infection. Living in symbiosis, good microorganisms protect our body by suppressing the excessive development of pathogenic bacteria and fungi. Destroying good microorganisms is quite dangerous for our health. Probiotics are able to rectify many of these harms and, at the same time, act as natural anti-inflammatory agents and help reduce the risk of diarrhoea that may result from the intake of antibiotics. What are reasons to take Lactoflor? One reason is that probiotics are agents which strengthen positive health. One reason for taking probiotics is that they have agents which strengthen positive health. Disease prevention and health promotion—associated with optimum care of our health—are fundamental concepts in today’s medicinal world. Probiotics are agents which enhance positive health; they help strengthen our natural immunity, detoxicate our bodies, and have an anti-inflammatory effect. Therefore, probiotics should be taken in all cases where there is a great risk of the development of large amounts of harmful bacteria in our bodies, including antibiotic treatment, bacterial or viral infection, overeating, unhealthy diet, physical exertion, and stress. Why is LACTOBACILLUS BULGARICUS?so special? Why is Lactobacillus bulgaricus called the strain of longevity and the secret to health? Lactobacillus bulgaricus is the only strain which does not permanently occupy the human colon. The rest of good bacteria are of animal origin and come into our bodies during delivery through the mother’s amniotic fluid and vaginal discharge. Lactobacillus bulgaricus is the only strain of plant origin. In nature, Lactobacillus bulgaricus exists in oak bark, herb blossoms, flowers, even in ants. Lactic-acid food is the natural supplier of this strain for our bodies. In the human body, Lactobacillus bulgaricus needs to cooperate with another lactic acid strain (Streptococcus thermophilus) in order to produce a strong immunostimulation effect, as well as anti-atherosclerotic and anti-cancer effects. Lactic acid bacteria also release other wholesome substances called bacteriocins, which also suppress the development of bacteria harmful to our health. What is the effect of probiotics on our immune system? Probiotics improve our immune system. 1. Phagocytes, lymphocytes, and immunoglobulins, which act as antidotes. 2. Interferons, which counteract viruses. 3. Bacteriocins, which counteract bacteria. 4. Cytokines, which bind our immune system into one. Probiotics are, therefore, natural bio agents that strengthen the human immune system and increase possibilities to quickly overcome various stressful conditions, physical exertion, and other issues. Consequently, it is important for probiotic bacteria to adhere to the colon—the strongest adhesive effect is attributed to Lactobacullus bulgaricus.